Racist political party, the BNP, are organising a march on Lewisham Islamic Centre this Saturday starting in Woolwich at 1pm. The BNP’s support has collapsed in South-East London in recent years. In the whole of Lewisham (in 2009) they had just 20 members – out of 280,000 people. This march is a clear attempt to capitalise on the appalling murder of Lee Rigby to stoke up community tensions and give the BNP local profile. I’ll be speaking to Labour party members tonight about what our response should be. Lewisham and Greenwich Councils are also working with the police to ascertain the likelihood of the march going ahead. We don’t want to give the BNP the oxygen of publicity – nor do we want to leave the Mosque feeling unsupported and isolated. Counter-protests are likely. It’s essential that counter-protesters behave peacefully unlike the thuggish BNP. People in Lewisham have a long tradition of standing up to racism and I’m sure we will do so again. Let’s make their racism history. Update: Lewisham NUT has put out a leaflet supporting a counter-protest. Just when you think it’s safe to eat food in a motorway service station again after a high-profile intervention from Heston Blumenthal, the God of Mammon intervenes and reminds you that greed is bad. 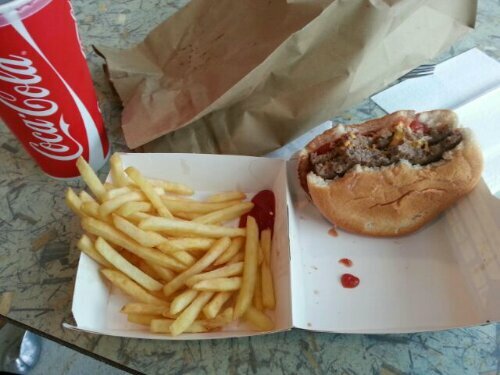 In particular, the greed that is The Burger Company is especially bad. A double-score of grissle sandwiched between two flat baps with a drizzle of red sauce, plastic cheese and “I can’t believe it’s not” plastic bacon. Oh and a huge bucket of ice. Yes, it’s expensive renting space in a motorway service station but Byron burger, the Gourmet Burger Kitchen and Uncle Tom Cobley rent space in Covent Garden, some of the most expensive real estate on earth. As the excellent burger review site Burgaffair will point out, you can eat an amazing burger in central London for £9 so why not off a slip road on a toll road? I have a barely-used current account with state-owned bank Natwest. They wrote to me today announcing they are introducing a monthly fee of £6 a month, just for having an overdraft, on top of an interest rate of 19.89% (that’s 40 times what the Bank of England charge Natwest). Increasing the equivalent interest rate on a £500 overdraft from 19.89% to 34.3%. Note: Natwest took £20 billion of our money in 2008. I’ve been the Chair of Lewisham’s Audit Panel since 2010 and during that period we’ve done a lot of work to create transparency over how we use interim managers and consultants. Now every single interim consultant and their pay is available for the public to see. Previously, confidentiality agreements meant we needed permission to ask interims whether we could publish their pay online, but over the last two years, their contracts have been updated to stipulate this is a requirement of the council. No publication, no pay. Political party “Lewisham People Before Profit” has accused the Council of wasting money on consultants. Instead of actually doing their research and providing a critique of how we use consultants, they have resorted to base populism. The issue is, if you tell the public that the local council is wasting their money, it’s very difficult to then persuade them to support local public services. Lewisham People Not Profit have ended up doing the Tories job for them, resorting to quick sound bites that do little to illuminate a complex issue, but a lot to damage trust in our local Council. Some of the consultants we use are very expensive indeed. This is not a fact lost on the Audit Panel as we’ve scrutinised the decisions of Officers. But there are projects that simply could not have been delivered without talented external expertise: we would not have rebuilt every secondary school in the borough in the past few years without people who had the experience to deliver projects worth hundreds of millions of pounds. We did not have this experience in house. The number of senior interim posts has fallen from 19 in Jan 2011 to 17 by the end of July last year. The number of paid consultants has fallen from 24 in Jan 2011 to 11 by the end of July last year. The next report on this will come to the Audit Panel in the Summer, and again we’ll be asking questions on this and doing the work that People Not Profit simply aren’t. On the day of the local elections, the Daily Express front page leads with an “explosive academic study” that the UK will be the West’s most ethnically diverse country after 2050. 1. 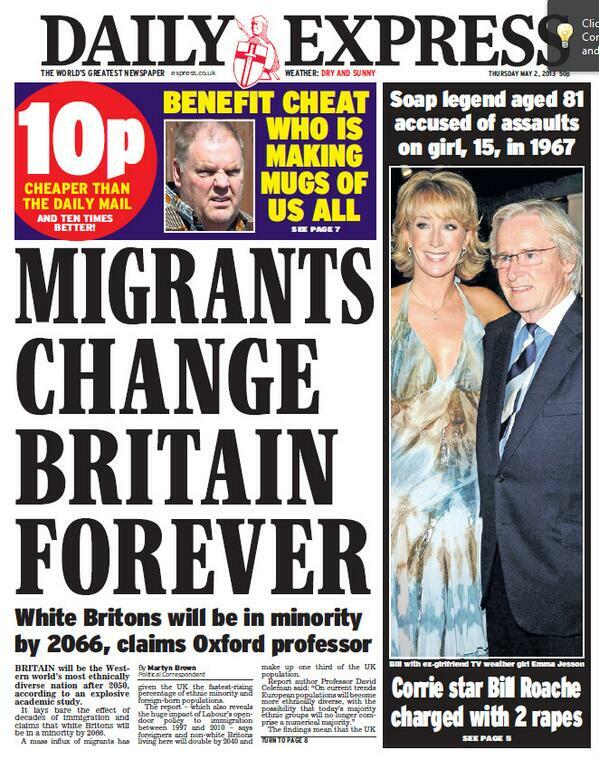 The figures include foreign born migrants, many of whom are white, so when the Express says “ethnically diverse” it is including white people. 2. Err, this explosive academic study was covered by the Daily Telegraph in 2010. That’s right, the Daily Express is reprinting a 3 year old study on the day of the local elections. 3. There are only three quotes in the piece. One by the Prime Minister, one by Professor David Coleman the author of the study, and another by Andrew Green from MigrationWatch. It is not pointed out to Express readers that both Andrew Green and Professor David Coleman are co-founders of MigrationWatch. So one organisation essentially gets two quotes. Hardly balance! Finally, the eminent Oxford Professor David Coleman’s views on eugenics aren’t pointed out either. Coleman has for a long-time been a member of the Eugenics Society and its successor the Galton Institute. But Coleman has not yet, for example, responded to David Aaronovitch’s invitation to him to disown the Galton Institute, nor has Coleman told us whether he subscribes to Sir Francis Galton’s definition of eugenics as the “science of improving stock – not only by judicious mating, but whatever tends to give the more suitable races or strains of blood a better chance of prevailing over the less suitable than they otherwise would have had”, or to Galton’s argument that democracies “must in self-defence withstand the free introduction of degenerate stock”.